The conference has been organised by the Irish Churches Peace Project as the churches begin to prepare for the 500th anniversary of the beginning of the Reformation. The decade of events in 2006-2017 offers the opportunity to re-evaluate Luther and events of Reformation in early 16th century. The main participants in the conference this weekend are staff and students from the four main theological colleges in Ireland: Union Theological College, Belfast (Presbyterian), Edgehill Theological College, Belfast (Methodist), Saint Patrick’s College, Maynooth (Roman Catholic) and the Church of Ireland Theological College, Dublin. She has been living in Ireland for over In Ireland 30 years since she came to study for her MPhil at the Irish School of Ecumenics in 1985-1986. She has also studied at the University of Tubingen, and her interest in theology and the visual arts led her to work on her doctorate in the field of theology and modern Irish arts doctorate in Milltown Institute. The doors of the church in Wittneberg … did Luther ever nail his 95 Theses to these doors? 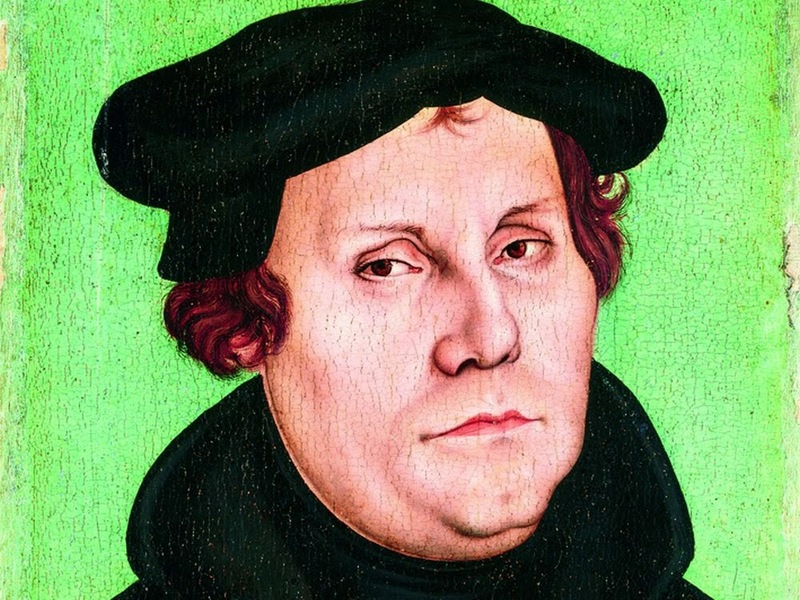 The anniversary commemorates the day Martin Luther (1483-1546) is said to have nailed his 95 Theses to the door of the church in Wittenberg, 31 October 1517, according to the Latin inscription above the door of All Saints’ Church. The original doors were destroyed in a fire, and in 1857 King Frederick William IV of Prussia had them replaced. Luther’s theses are engraved into today’s bronze gate, although Gesa questioned the historical accuracy of the myth, and said Luther probably first sent the 95 Theses around to his fellow clergy as a discussion paper. Luther is the seminal figure in the Reformation in the 16th century, although there had been previous reformers, such as John Wycliffe and Jan Hus, and mystics such as Thomas a Kempis, who also influenced Erasmus, Calvin and other contemporaries, both humanists and reformers. Luther strongly disputed the claim that freedom from God’s punishment for sin could be bought, and his 95 Theses developed his response to Johann Tetzel, a Dominican friar who was selling indulgences. Despite the demands of Pope Leo and the Emperor Charles V, he refused to retract his writings at the Diet of Worms in 1521 and was excommunicated and condemned as an outlaw. He urged going back to the sources of the Christian faith – the Bible, the Creeds, and Patristic sources – and he regarded conscience and truthfulness more important than his survival, rank and status. His intention was to reform the Church but not to break away from the Church. The Augsburg Confession of 1530 sets out 28 articles – 21 normative principles and seven antitheses – that are foundational for all Lutheran churches, and it remains the most important of all Protestant confessions, she said. Although the reforms were long overdue, the split never need to have happened, she said referring to the 1999 joint declaration on justification. She presented the question of justification by faith as one that asks how can I find a gracious and merciful God. Luther, who had been troubled by his own scrupulousness, came to see salvation a divine gift freely given. His foundational principles of Scripture, Grace and Faith alone were strongly influenced by Saint Paul and Saint Augustine. But it is often asked whether he regarded good works as irrelevant. She pointed out that Luther speaks positively of good works done out of faith and love, and of loving works towards neighbours. He said we are made righteous through faith alone, but good works towards our neighbour is a necessary and willing choice for the Christian, that we may be Christ to one another. He objected to the notion that one could buy a place in heaven, and make oneself right before God without repentance and change of heart. Faith is the Christian response to God’s grace, and God in Christ then calls us to love God to love our neighbours as ourselves. Faith is a gift that comes from grace, and grace comes from God and enables faith. Faith is God’s work in us that changes us and makes us new persons in Christ, so that we cannot but help doing good works. She also pointed to Luther’s hymns as an expression of his theology, and said he saw music as next to the word of God. His hymns are marked by a Trinitarian approach and an unwavering faith in God and God’s kingdom. His hymn ‘A mighty fortress is our God’ became the Lutheran signature hymn or anthem. The joint declaration on justification 1999 was the fruit of 30 years of work, and the she believes the fundamental point of division has been lifted and largely resolved. We are now rediscovering through each other what we was lost in the divisions of the past, including the riches of Biblical studies and sacramental life. • Anyone who is to find Christ must first find the Church. • Pray and let God worry. • Even if I knew that the world would go to pieces tomorrow I would still plant my apple tree today. • War is the greatest plague that can afflict humanity, it destroys religion, it destroys states, it destroys families. Any scourge is preferable to it.